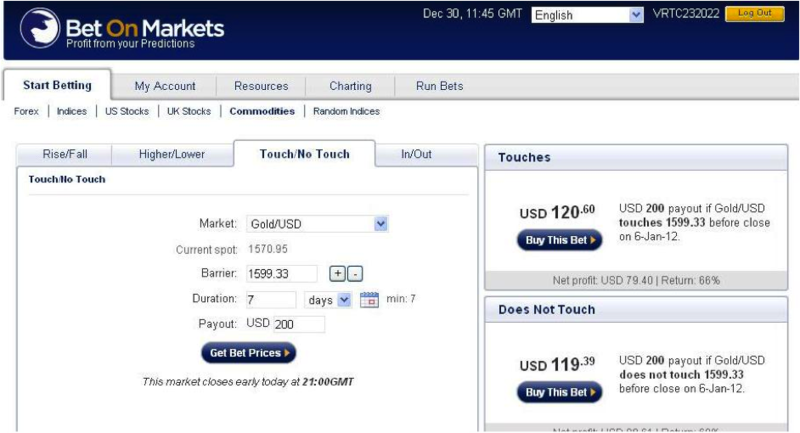 The Touch binary option trade is one of the binary option trades in the Touch/No Touch category. Touch is based on if the price action of the traded asset touches a price barrier before the expiration of the trade. A “One Touch” binary option is a trade type where the trader purchases an option that will deliver profit if the market price of the asset purchased touches the set target price at least once before the expiry of the date. If we look at the chart below, this shows an example of a One Touch trade on the trading platform of Betonmarkets, one of the binary options brokers that offer this trade variety. We can see here that the financial asset is spot gold, to be purchased at a spot price of 1570.95. The price barrier (which can be adjusted by the trader) has been set in this example to 1599.33. The payout for this trade, including the original capital is $200. For us to trade the One Touch, we have to buy the bet at a price of $120.60, and set the expiration to 7 days (which is the minimum expiration time Betonmarkets allows on their platform). This gives a profit of roughly 40% if the trade is a winner. Now notice a few things. The profit payout is only 40%, which in binary options terms, is nowhere near the maximum payout of 80 – 85%. The reason for this is that our price barrier is quite close to the current market price. As a rule, the closer the price barrier to the market price, the lesser the payout the trade will give. Let us look at a live trade example of gold, done on 19th October 2011. The trade was a Touch trade, aiming to predict that the price of gold would hit $1690 an ounce before the 7-day expiration on Betonmarkets. At the time of the trade, gold was at $1649 an ounce. The fact that our price barrier of $1690 was far from the market price meant that the trade only cost $45.59, expecting a total payout (capital + profit) of $100 from the trade. By day 2, the price of gold had begun to drop, and even went as low as $1603 an ounce, sending the trade down. A reverse head and shoulders pattern developed on day 3, causing a remarkable spike on the 4th day that sent the trade into winning territory for the payout. This is one way to play the markets. – What price barrier do you set to allow the trade make that single touch? – How far should you set the price barrier to enable the best possible payout without setting the target too far out? – What expiration time do you use? The first thing to realise is that the touch you need could be in any direction, bullish or bearish. You must carry out proper technical and fundamental analysis to determine which direction the market is most likely to end up. This will enable you set the correct barrier. In our example, the fundamentals were pointing to renewed safe haven purchases of gold as a result of the Eurozone crisis; a trade call which turned out to be correct. Secondly, tweak the barrier prices. Binary options platforms are set to allow you know what the trade costs and payouts will be. That way, you can strike a good balance between costs and payouts. Thirdly, platforms like Betonmarkets have a default minimum of 7 days. This is a reasonable time to give a trade to make the target. All it takes is one touch. Even if the market reverses thereafter, you have achieved your target and by the 7th day, you will get paid. So trade the One Touch and make your money using these strategies.